JUPITER, Fla. — This afternoon, on the eve of report day for St. Louis Cardinals pitchers and catchers, the clubbies continued setting up the clubhouse by hanging jerseys at each locker … with, um, care. 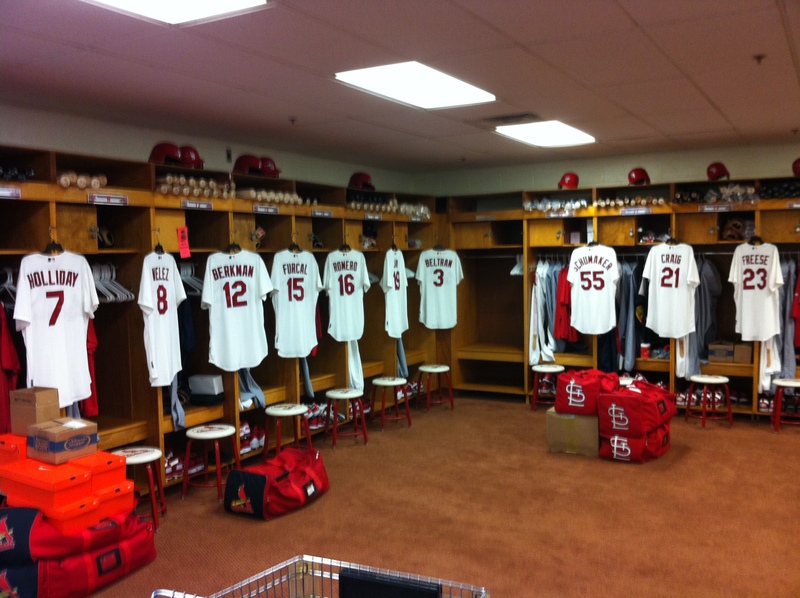 Jerseys hanging at lockers in the Cardinals' clubhouse in the spring training complex at Jupiter, Fla., on Feb. 17, 2012, two days before the team's first official workout. The unopened bags, the anticipation of spring training’s opening, the jerseys hung ever so carefully — why that phrase kept clinking around in my skull all afternoon and the obvious result was — what else? — a poem, starring the local nine and even some of the journalists who cover the club. Here goes. in hopes that the Cardinals soon would be there. eager for that whack that smears the signature from Bud. had just sent our stories to beat a deadline slog. JUPITER, Fla. — The first act of spring actually occurs back where it’s winter. It involves rolling up T-shirts, identifying books that are worthy of the trip south, stacking yellow legal pads, making sure there’s a raincoat handy, and otherwise packing for the longest road trip of any baseball season. The goal is to fit all that stuff, snugly, into as few pieces of luggage as possible, while also making sure all of the essentials fit into one of two carry-ons. Can’t have that Skype-ready webcam lost in transit. The days before arriving at spring training involve feats of geometry. The first day on the ground at spring training is an experiment in trigonometry.